Are you following my Outfit Envy board on Pinterest? It’s where I capture my favorite street style and blogger looks around the web! Lately a few favorites include this trenched look from Anh of 9to5Chic, this creative mix of neutrals, and this chic suspenders outfit from Framboise Fashion (her hair is also bomb). I personally would love to recreate this look and this oversized blazer + pencil skirt combo too. Which are your favorites? Not sure if you’ve heard of her yet, but Ivy Kirzhner is a new-to-me shoe designer that I discovered at Neiman Marcus. My eyes were immediately drawn to this pair of boots, simply because they look like a chic and less expensive alternative to the Chanel gold-toed boots from the Paris-Dallas collection! Aren’t they fab? These Ivy Kirzhner boots are actually $1,000 less than the Chanel boots and have a bit more flair with a few more studs and some cutouts. There’s also a really cute heeled sandal version in black and also available in a sand + taupe color combo (pictured above). Being a born-and-raised Texan has me very eager to buy into the western trend being embraced by all designers for fall! Seeing as the Nordstrom Anniversary Sale opens to the public on the 17th (stay tuned for my favorite sale finds Thursday morning! ), I thought I’d share a few new arrivals that have captured my attention this week. This two-tone cashmere coat is at the top of my list – it’s a gorgeous wardrobe staple that’ll last for years. This animal-print jacquard number is far too fabulous not to buy! I’m obsessed. Is it wrong that I also want this leopard-print top? Oh, and I still want these. Great picks! #4 is everything. Obsessed with that bauble bar necklace! I haven’t ever loved a piece of theirs as much is this necklace! Amaze!! Her hair is fabulous, I repinned those from you! I love the black and white picks, especially that McQueen dress. I want everything here. I’m hitting the Nordstrom sale too. Can’t wait to compare our picks. Amazing picks! #16 is stunning!! 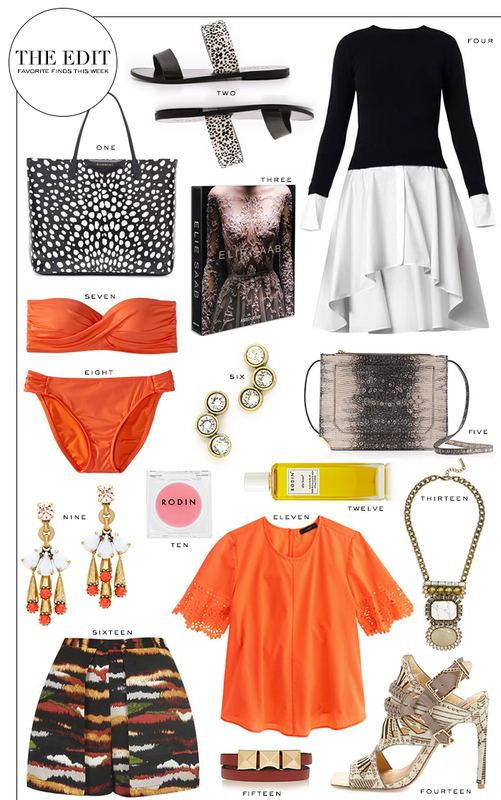 Loving that orange laser cut top from J.Crew. It would pair perfectly with white jeans and leopard sandals! I’ve been obsessed with that lazer cut top since I first saw it. Love! These are all such impeccable picks. I’ll have 2 and 11, amaze! #14 please. I refuse to let myself even click the link haha! Everything that is black and white is divine! I love those picks. Love this edit!Perfect transition pieces for summer into fall. Orange has been on my radar lately.